As a fan of the Iowa Hawkeyes football team, you have come to the right place on the Internet to find out where to watch Iowa football online legally. We compile all the official sites that stream University of Iowa football games and deliver our listings for free to the fans. Watch Iowa Hawkeyes sports online 24 hours a day – whether you want football, basketball, hockey, baseball, wrestling – if you want it, you can watch it online, even the classic games from the past and all the games played today. These listings are to the legal, official digital media providers of University of Iowa Athletics. Big Ten Football Online is a fan site that helps fans find out where to watch Iowa football online legally. We do not and have not ever hosted any illegal Iowa football live streaming information or posted any links to games other than the official Iowa Hawkeyes football live streams. Please bookmark Big Ten Football Online for all the legal, official live streaming football game links for each Big Ten Conference team in one useful location. Find the official broadcasts of Iowa sports in digital high definition streaming video. Watch behind the scenes commentary and live action from all Iowa Hawkeyes varsity sports teams. Stay connected every second to the Iowa Hawkeyes through social media updates. Get it all in streaming video delivered to your computer or cell phone. Watch Iowa football games online – Find out where you can watch Iowa Hawkeyes football on your PC, iPhone, iPad or tablet. The Iowa Hawkeye Sports Network streams all the Iowa football games on the Internet. That means all conference games and non-conference games the Hawkeyes play. Every University of Iowa varsity sport is televised through the Big Ten Network, ABC, FOX Sports and ESPN and streamed online through BTN2Go, the official Iowa Hawkeyes streaming media provider. Also, with BTN2Go International, fans that live outside of the US can watch Iowa football games online, anywhere in the world. 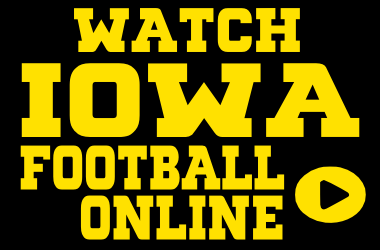 The most popular place to watch Iowa football online is Hawkeye All Access. Get exclusive coverage of every Iowa Hawkeyes sporting event live streamed to all your devices straight from the official live streaming digital media partner of the University of Iowa. You’ll see quick that it’s the best way to watch the Iowa football game online! The University of Iowa was founded in 1847 in Iowa City. There are 31,500 students currently enrolled at the University of Iowa. The school colors are black and gold and the varsity athletic teams are called Hawkeyes. The Iowa Hawkeyes began playing varsity football in 1889. Iowa’s home football stadium is 70,585 seat Kinnick Stadium, built in 1929. Iowa’s main football rival is Nebraska. This renewed rivalry game is played on the final week of the season and the two teams play for the coveted Heroes Trophy, which is awarded to the winning school. Visit Big Ten Football Online to find out how and where to watch Iowa Hawkeyes football games online for free this season. Get the schedule, date, time and channel for every Iowa football and basketball game.